What do the 5 Health-Related Fitness Components encompass? The 5 Health-Related Fitness Components combine to form the concept known as Health-Related Physical Fitness (HRPF), a term which is more often referred to simply as Health-Related Fitness. The fitness world seems to utilize the concept 'Health-Related Fitness' like a generic fitness principle. While all these terms can be included under the broad term: 'Health and Physical Fitness', they individually refer to different aspects – both generic and specific. Unfortunately, references to these and other fitness-related terms are often vague, while consistency in their intended use is meager at best; there is a kind of 'generally-accepted' use for them, but individuals often rely on own-interpretation, and this often leads to confusion. A closer look at the concept 'Health-Related Fitness' reveals that there's a whole lot more to it than meets the eye. This is a concept which was intended to primarily address public health and provide some means of measurability. Thus, it has a specific intention. In order to better explain the Components of Health-Related Fitness and their intended use, let’s first briefly clarify what Health-Related Fitness is, and why it's of interest, especially to Fitness Trainers and Health Instructors. As the PCPFS notes, there is a cause-effect relationship between physical activity and health. Plainly said, with increased levels of activity, we improve our levels of physical fitness and enjoy better health, afforded by the benefits of exercise. Although the Health-Related Fitness Components are assessed individually, it is essential that they are viewed integrally when considering 'levels' of Health-Related Physical Fitness; even though each of them is intended to contribute in equal share to overall Health-Related Fitness. To this effect, individual attention of the components is primarily for the purpose of measuring them. What other use is there for the Health-Related Fitness Components? What practical use, other than measurement, is derived from breaking the concept Health-Related Fitness down into its 5 components? Health professionals assess the respective levels of the 5 components in order to review them with would-be clients. This way, they can develop individual exercise programs to the meet particular needs of individuals. Naturally, these assessments are client-specific, paying due regard to the general health and physiological state. For example, one would not simply put a previously inactive person through the rigors of testing without adequate screening and preparation. The authority on Health-Related Physical Fitness assessment, is the American College of Sports Medicine (ACSM). 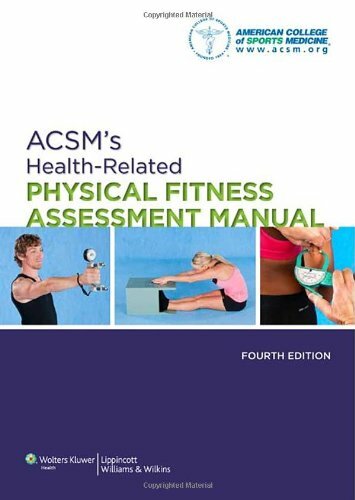 ACSM's Health-Related Physical Fitness Assessment Manual provides thorough guidelines for the assessment of Health-Related Physical Fitness. The ACSM and the American Heart Association (AHA) have made recommendations for Physical Activity and Public Health, which provide an essential adjunct to the afore-mentioned manual in Physical Activity and Public Health -- A Recommendation from the Centers for Disease Control and Prevention (CDC) and the American College of Sports Medicine, JAMA 02/01/1995; 273: 402-407 (accessed October 12, 2009). We covered a fair bit of terminology on this page about the terms and meanings of 'fitness' (particularly health-related) and its components. Although my usual audience is likely to prefer not getting bogged down in detail – by instead opting for the Sensible Fitness Program, I nevertheless feel it's part of the sensible approach to make it understood that fitness can be desired or needed for several different reasons. In simple terms, you could be into fitness for more than just getting into great shape.